The First orphan girl scholarship of Helping Hands NGO goes to martyr police constable late late Nada Umbing 4 year old daughter -Miss Nada Senyi. 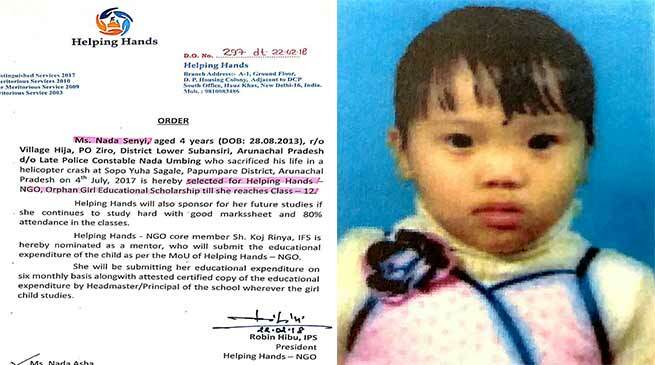 This was informed by Robin Hibu-IPS who is also the president of Helping Hand NGO. Her father died in helicopter crash during rescue operation in Sagalee forest in Papum Pare district in the month of June 2017. It must be mention here that Helping Hands NGO has introduced CSR orphan girl child scholarship to help orphan girl to educate them and has even reserved coaching scholarships for medical, engineering and UPSC scholarship. Members of Helping Hands Ngo believe that, they can do the least for these martyrs who gave their lives for society by taking care of the educational expenses of their girl child. “It was choking emotive conversation with the Mrs Nada Asha, the widow of late Nada Umbing while informing her about the selection of scholarship for her tiny 4 year old daughter ….. she just only uttered with mumbling with chocking voice ….” Robin sir, thank you …i was worried for my little daughter’s future without father…..”, Hibu added.